The meeting was called to provide feedback on various meetings and consultations which committee members had attended. To operate some others via Eaglescliffe/Stockton and Durham rather than Darlington/Durham, so serving a larger population base. Rail North (Leeds 28th Nov) & Transport for the North (Newcastle 30th Nov) – A Strategic Transport Plan was being developed for consultation with the expectation that letting of the Northern & Transpennine franchises would be wholly devolved to Transport for the North by 2024. Mike Hill MP (Hartlepool 5th Jan)- A useful interchange of information had taken place with the Hartlepool MP. We had been able to acquaint him with our aspirations and concerns and update him with Coastline developments. He would use us as a first point of call for information on railway matters. Northern Railway CRP meeting (Middlesbrough 11th Jan) – This was an update on current thinking and progress towards a Tees Valley Community Rail Partnership covering Sunderland – Middlesbrough, Saltburn – Darlington and the existing Darlington – Bishop Auckland CRP. Whilst becoming a single CRP it was envisaged that there would be individual paid officers for each of the three lines. Funding would come from a combination of the DfT, relevant Local Authorities, the Tees Valley Combined Authority, Northern Rail and ACoRP. The existing Esk Valley CRP was yet to decide whether or not to join this regional scheme. Ian Davis ACoRP’s Operations Officer will be our guest speaker on March 8th. Meanwhile we were encouraged to participate in the DfT online consultation on ‘The future of community rail strategy’ which closes on 28th January. The next Open Meeting of the Coastliners Rail User Group will take place on Thursday 18 January 2018 at 7.15pm in the Reading Room of The Athenaeum Club, Church Street, Hartlepool. The room will be available to us from shortly after 6.30pm and we will be welcome to use the bar until it closes not long after 10.30pm. This will be an information meeting as there is a lot going on behind the scenes on which to both report and discuss. Since the last meeting the Coastliners committee has met with with Alex Bray, Stakeholder Liaison Manager at Cross Country, in regard to the forthcoming invitation to tender for the Cross Country franchise and expects this week to meet with Hartlepool’s Member of Parliament, Mike Hill in order to exchange views on railway matters. Additionally Northern Railway will have held a meeting on 11th January, on the subject of Community Rail Partnerships. There is therefore much to discuss on 18th January. Both members and fellow travellers are welcome. 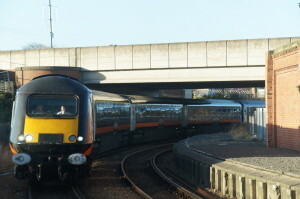 Ten years after Grand Central ran its first service from Sunderland to Kings Cross on 18th December 2007, the final HST journey ran on New Years Eve. 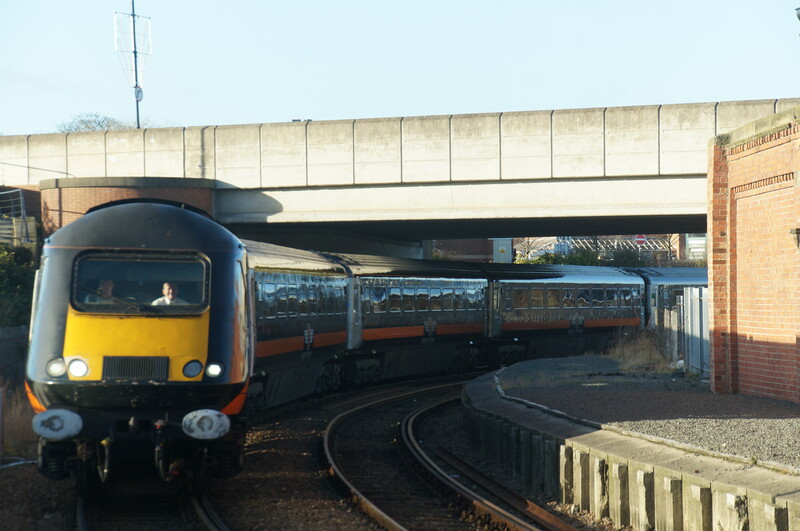 Pictured is 1A61, the 1212 Sunderland to Kings Cross arriving at Hartlepool on the last southbound HST service. This would return as the last train 0f 2017 back to the North East the 1647 from Kings Cross (1N94). Their lease to Grand Central having expired these three HSTs are moving to East Midland Trains. We will miss these 40 year old iconic trains (and especially Coach A) which are being replaced by more 180’s from First Great Western to standardise the fleet.